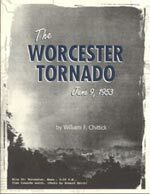 Wimco's own Bill Chittick chronicles the epic F5 Worcester Tornado that devastated central Massachusetts 50 years ago, killing 94 people and inflicting more damage than any other tornado in U.S. history at the time. As a result, it was the pivotal turning point between the old days of weather reporting and modern tornado forecasting. Bill's compelling account, in commemoration of the storm's 50th anniversary, is lavishly illustrated with rare photos, maps and charts, as well as eyewitness accounts. Order your personally autographed copy today!